Complete guide to the 9 best rooftop bars in Paris in 2019. 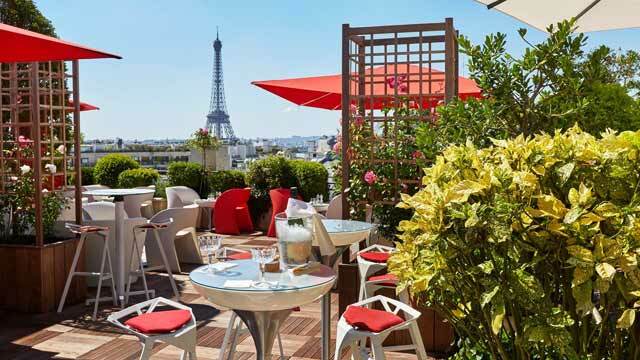 So, which is the best rooftop bar in Paris? Here you'll find the best Paris rooftop bars with all info you need about each place. Opening hours, dress code, photos, maps and much more. One of the most famous cities in the world. Paris is packed with historical buildings and monuments. And what better place to see all this, then from a roof terrace. 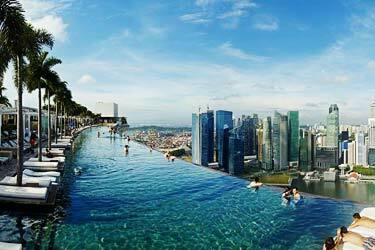 Most of the rooftops here are located at picturesque hotels or fancy restaurants. 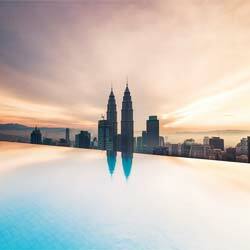 Perfect places for some drinks with a view. 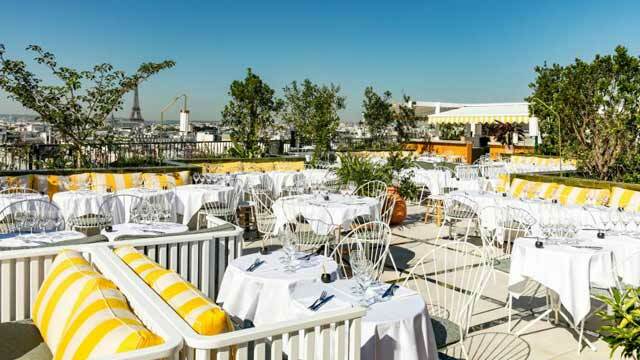 Find the Paris rooftop bar best suited for you, right here. Or use the Paris rooftop map in the bottom right corner. 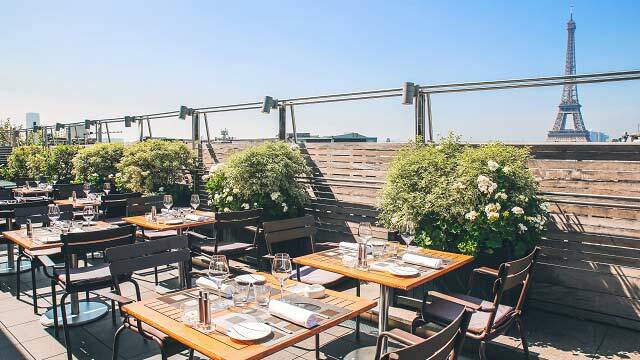 A stylish and trendy French restaurant and rooftop bar, equipped with a terrace that offers what might very well be THE best view of the Eiffel Tower. Located in the Palais de Chaillot, the al-fresco terrace beautiful in decoration and here you can enjoy fine-dining cuisine, a great selection of wines and mixology cocktails of the highest standard. Luxurious and sophisticated, yet cosy and welcoming, Café de l'Homme is a great spot for a sunny lunch, and even better for a romantic dinner. One of the most cozy and sophisticated rooftop restaurants and bars Paris has to offer. Located on top of the Terrass'' Hôtel Montmartre, up here you get a magical panoramic view of the entire city with many of its famous buildings as background. The terrace is lush and intimate, stylish decorated with green plants, dining tables and comfortable sofas. Visit for breakfast, lunch, dinner or just crafted cocktails with a view, all in a very pleasant ambience. For one of the best outlooks in Paris, head up to the rooftop of the Galeries Lafayette department store. Seven floors up, this terrace offers a really impressive 360° view over Paris, with the Opera House in close range and the Eiffel Tower as the stately backdrop. 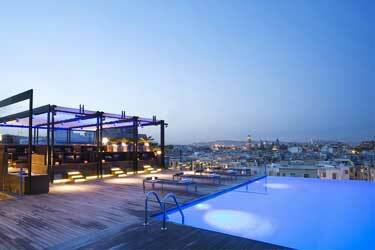 But not only about views, the terrace also holds a modern and sleek rooftop bar called The Cube Bar. Perfect spot for a sunny daytime beer or cocktail, the bar is also open in winter, with rooftop igloos keeping guests warm and cosy. La Terrasse on top of the five-star Hotel Raphael is both a luxurious champagne rooftop bar and a classy rooftop restaurant. Located right by the Arc de Triomphe and Champs-Élysées, the views over the Eiffel Tower and Paris skyline are amazing. Very lush and green, the terrace is divided in two, where the rooftop bar is a bit more casual with red & white chairs and the restaurant is a bit more upscale. Visit for either a romantic dinner just to enjoy fantastic cocktails and amazing views. 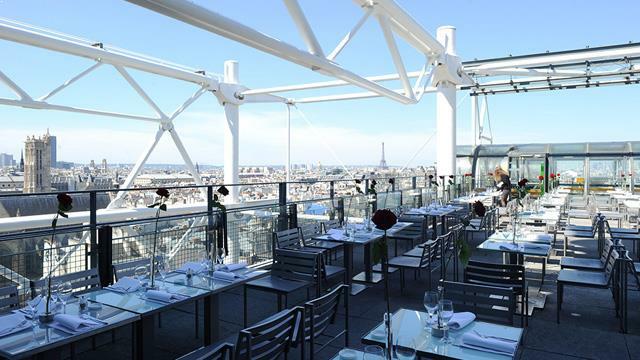 Perched on the roof of the Centre Georges-Pompidou you find this rooftop gem, working both as a fine-dining restaurant and a hot nightspot. Spacious and with a minimalist style decoration, the restaurant offers seating both on the al fresco terrace and indoors, everywhere with a breathtaking scenery of Paris. The restaurant serves modern French cusine for both lunch and dinner, and as the night wears on the rooftop is a great spot for cocktails and views with a group of friends. On this somewhat hidden, but quite magical rooftop bar you get a spectacular 360-degree view of the Paris skyline as far as the eye can see. Perched on the 9th floor of the Holiday Inn Paris Notre Dame, the rooftop bar is open nightly and in full swing during spring and summer. 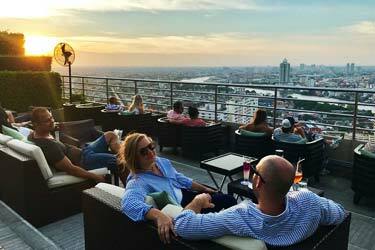 The terrace is quite lush and the full service rooftop bar offers classic coktails, wine, champagne, beer and anything else you might need, along with smaller bites and plates to share. A very classy and luxurious rooftop bar and restaurant, with a beautiful view of Paris and the close by majestic Eiffel Tower. The name actually means 'the shadows', coming from the shadows that the Eiffel Tower cast on the terrace. Located on top of the Musée du quai Branly, Les Ombres is open daily for lunch and dinner, serving contemporary and creative French cuisine along with fine wines and tasty cocktails. A perfect spot for a romantic rooftop dinner. A fine-dining, panoramic restaurant, perched on top of the Theatre des Champs Elysées. The spacious restaurant is set over two floors and also comes with two terraces. 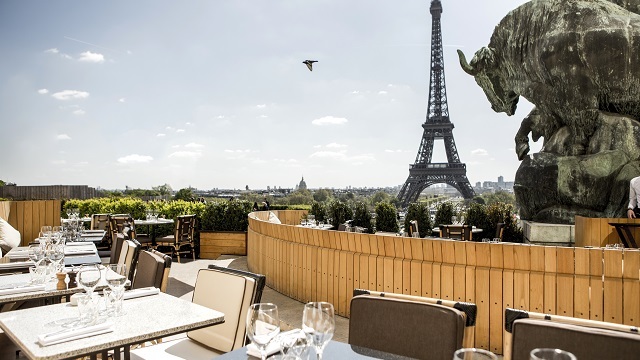 With magical views of the most famous buildings in Paris, including the Eiffel Tower, the restaurant offers French cuisine of the highest class and a very impressive wine list, all in an elegant and stylish setting. On late Saturday nights the rooftop transforms into the hot, chic and trendy Club Montaigne. A spacious rooftop cocktail bar and restaurant, perched on the top floor of the shopping center Printemps Haussmann. Lush and garden like, with 'summerish' lounge sofas and dining tables, the rooftop terrace offers a magnificent 360° view of Paris. Open daily from quite early to late night, the rooftop offers seating both at the terrace and in the stylish indoor restaurant. Enjoy fantastic cocktails, created by famous mixologist Nico de Sato, or choose from a rather short but delicious food menu. Discover the biggest collection of Paris activities, guided tours and skip-the-line tickets. Anything you want you'll find right here. Which are the best rooftops in Paris? This complete guide will help you find the best rooftop bars in Paris. Paris is teeming with cozy cafés, world-class restaurants and bars. And of course, the amount of rooftop bars in Paris are high as well. The best places to drink with a view at, in this city is open virtually all year round, thanks to the Mediterranean climate. The view from the terraces is usually of and beyond the city's famous buildings and the Paris rooftops. And the typical Paris rooftop bar usually have a drink and food menu that can make anyone happy. Geographicly, the terrace bars here are quite scattered over large parts of the city. But most are located in close proximity to the Seine River, which flows through the city. Considering the size of Paris and how widespread the city is, there is often quite a distance to travel between the different Paris rooftops. The easiest way is to take the subway or taxi. Most of the best rooftop bars in Paris has a view over the city skyline and the Eiffel Tower as a magnificent backdrop. A typical terrace fits these criterias. And if you like to find the rooftops closest to your location. Just use the map on this site. Paris is France's largest city and also the capital city. 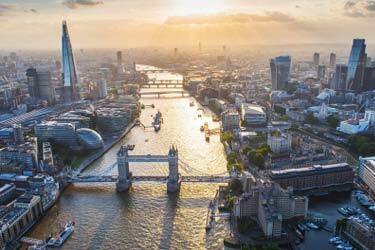 The city is one of the globally most important cities in the world regarding politics, technology, art, fashion and gastronomy. 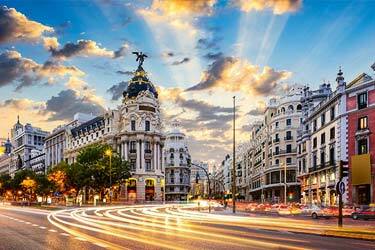 About 30 million tourists comes here every year making it one of the world's most visited cities. Paris is located on the River Seine and has lots of attractions and historic buildings. For example, one you see the Eiffel Tower, Arc de Triomphe, the Champs-Elysees, the Louvre, Notre Dame, etc. 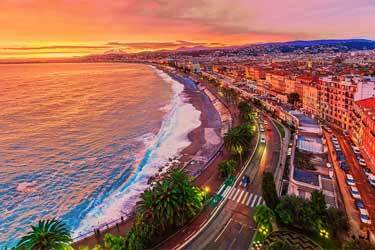 France and Paris is world renowned for its excellent food and superb wines. 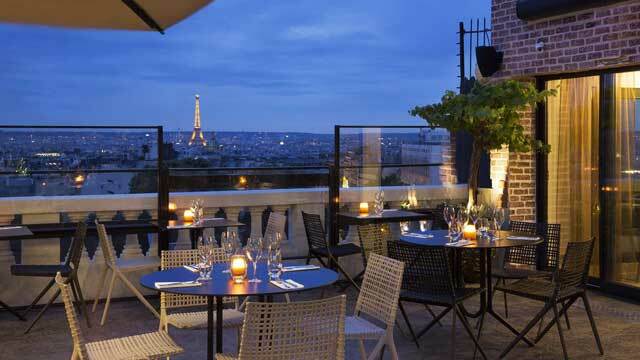 And the rooftop bars in Paris is no exception. 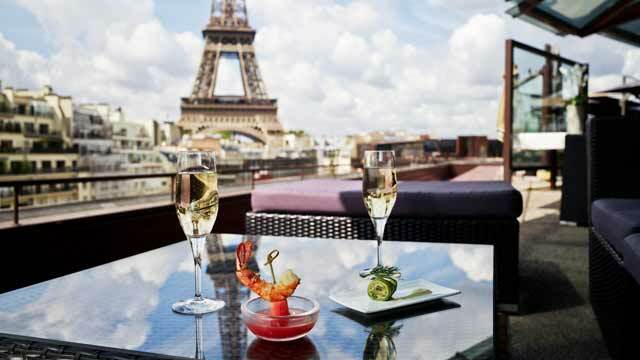 In many of the rooftop bars in Paris you can eat good food with a wide selection of both wines, beers and cocktails. Foremost, the classic French small dishes are served, but in many rooftop bars in Paris you can also get the classic bar bites such as burgers, salads and so on. Most rooftops in Paris are a little bit more calm and relaxed. So for those who like party it’s best to visit the rooftop bars before the party to charge up with drinks, and then get out into the Paris night right after. As with many other European cities, Paris is a fairly low-built city. 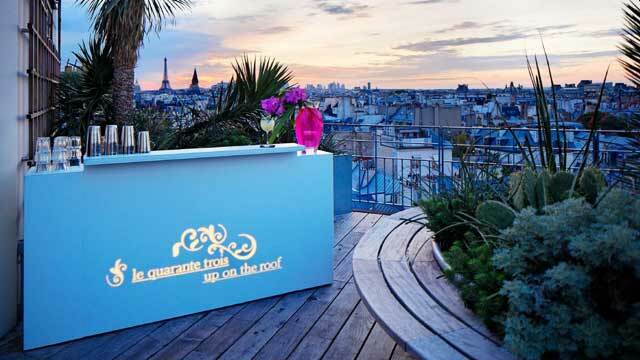 This results in many of Paris rooftop bars being located at a relatively low height. Despite this, you can get absolutely breathtaking views across Paris and its surroundings from some of the roof terraces. Often, with the Eiffel Tower as the main point of view. 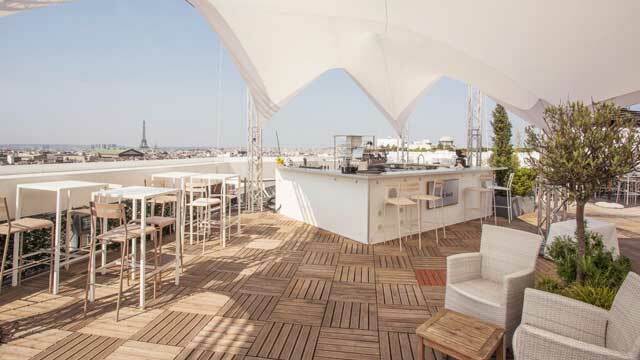 Some of Paris rooftop bars can boast a 360-degree view, but it is not very common here. Paris is a metropolis with its famous attractions. 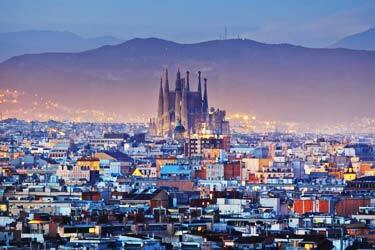 Here you can visit historical buildings such as Notre Dame, the Eiffel Tower, Arc de Triumph, Champs Elysee etc. If you like art, some of the world's most famous paintings are to be found here. Or how about one of the world's most famous paintings - the Mona Lisa. If you like sports, one of the world's best football teams plays here. Paris Saint Germain who play their home games at the Parc des Prince. For people that already been here and seen it all, it is usually Paris restaurants that’s the main focus. Here there are lots of fantastic restaurants and super cozy cafés.